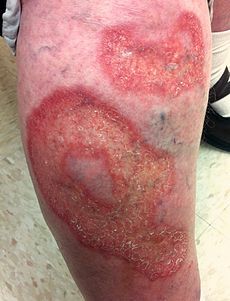 Necrobiosis lipoidica diabeticorum ("NLD") is a skin disorder that usually occurs on the lower legs. It is more common in women, and there frequently are several affected areas. The lesions are often asymptomatic but may become tender and ulcerate if injured. NLD is described as a hardened, raised area of the skin, with the center of the affected area usually has a yellowish tint while the area surrounding it is a dark pink. Another description of NLD is as slightly raised shiny red-brown patches. The centers are often yellowish and may develop open sores that are slow to heal. Pictures of NLD are available on-line (see References, below). NLD usually occurs in people with diabetes, or in people with a family history of diabetes. NLD may precede the diagnosis of diabetes, thereby alerting the physician to screen for the possibility of diabetes. A few studies reported that around 0.3 to 0.7 percent of people with diabetes develop the lesions of NLD.1 The cause of NLD is unknown. NLD usually goes through stages of activity and inactivity. One is not able to predict when the condition will flare. Treatment of NLD is difficult. Sometimes NLD responds to topical cortisone creams, especially if covered ("occluded") with an airtight dressing. Cortisone injections can also be used to treat NLD. These may be more effective than cortisone creams. At Medscape. Requires free registration. With pictures. from the American Osteopathic College of Dermatology. With pictures. 5. Can you identify this condition? From the College of Family Physicians of Canada. With pictures. 6. Resolution of long-standing necrobiosis lipoidica diabeticorum (NLD) lesion after restoration of euglycemia following successful pancreas after kidney (PAK) transplantation: a case report. 7. Does pancreas transplant in diabetic patients affect the evolution of necrobiosis lipoidica? Int J Dermatol. 2009 Sep;48(9):964-70. 8. Healing of chronic necrobiosis lipoidica lesions in a type 1 diabetic patient after pancreas-kidney transplantation: a case report. J Endocrinol Invest. 2007 Mar;30(3):259-62.